(from Wikipedia, the free encyclopedia) The M151 MUTT was the successor to the Korean War M38 and M38A1 jeep Light Utility Vehicles. It was produced from 1959 through 1982 and served in the Vietnam War. The M151 utilized a monocoque design making it roomier than previous jeep designs, and incorporated an independent suspension with coil springs. It has since been replaced by the larger AM General HMMWV in most utility roles in frontline use. With some M151A2-units still in US Military service in 1999, the M151-series achieved a longer run of service than that of the WW2 MB/GPW, M38 and M38A1 series combined. In 1951 Ford Motor Company was awarded the contract to design a 1/4 ton 4x4 Military Utility Tactical Truck (hence MUTT) to replace the M38 and M38A1 model jeeps. The M151 'MUTT' was developed with guidance from the US Army's Ordnance Truck Automotive Command. Design started in 1951 and testing and prototyping lasted through most of the fifties. 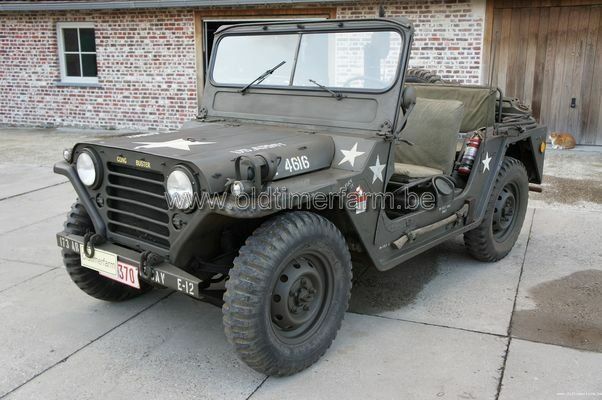 Although the M151 was developed and initially produced by Ford, production contracts for the M151A2 were later also awarded to Kaiser Jeep and AM General Corp. Although the M151 mostly retained the same basic layout and dimensions of its predecessors, it was for all intents and purposes a completely new design. Unlike previous jeep designs, whose structure consisted of a steel tub bolted onto a separate steel frame, the M151 utilized a monocoque design, which integrated the box frame rails into the sheet-steel body-structure. Eliminating the separate frame gave the M151 slightly more ground clearance, while at the same time lowering the center of gravity. This process slightly enlarged the vehicle, making it roomier than previous jeep designs, while retaining the same light weight. Another area improved upon in the M151 was the suspension. 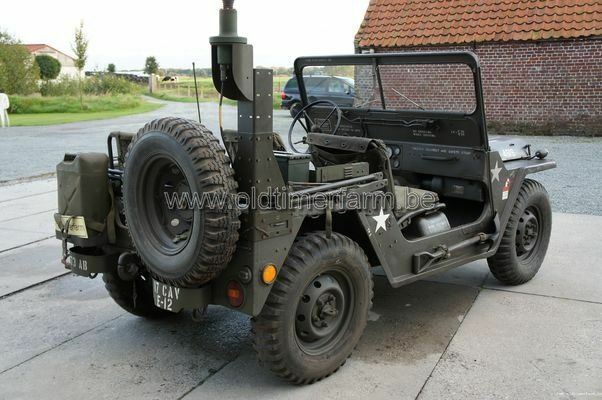 Dispensing with the rigid live axles in the front and rear that all previous military jeeps used (a layout still used on modern day Jeeps, such as the Jeep CJ and Wrangler) , the M151 was instead equipped with independent suspension and coil springs. This made it capable of high-speed, cross-country travel, while boasting high maneuverability and agility. The new suspension also had the added benefit of providing a more comfortable ride. Due to copyright and trademark issues, the M151 did not feature Jeep's distinctive seven vertical slot grille, instead, a horizontal grille was used. Unlike some other military transports, such as the Humvee or Jeep, the M151 was never widely released into the civilian market. This was partly because it did not meet Federal highway safety standards for civilian vehicles, and also because of a series of early rollover accidents. While these were often blamed on the independent suspension (which played no small part), they were also due to driver errors, with operators unprepared for the increased performance compared to the Jeeps which it replaced. At high road speed, the rear suspension in a lightly loaded MUTT had a tendency to tuck under the vehicle during turns, causing it to roll. The vehicle's tendency to roll over was reduced when there was weight in the rear, so drivers would often place an ammunition box filled with sand under the rear seat when no other load was being carried. The box could simply be emptied or abandoned when the extra weight was not needed. The handling issues were eventually resolved by a redesign of the rear suspension, introduced in the M151A2 model. However, due to liability concerns, the US Department of Defense deemed all M151 series vehicles "unsafe for public highway use", limiting their public use. Continuing problems with vehicle roll-overs into the 1980s led the US military to retrofit many M151 series vehicles with the "Roll over protection structure" (ROPS), a roll cage intended to protect both front and rear seat passengers. First put into service in Vietnam, the MUTT played an active part in American military operations well into the 1980s, when it was phased out in favor of the Humvee. Despite its official replacement, the M151 had some distinct advantages over its much larger and heavier successor, like being small enough to fit inside a C-130 cargo plane or CH-53 heavy transport helicopter. This flexibility was one of the reasons the US Marine Corps deployed M151 FAV (Fast Attack Vehicle) variants through 1999, in places like Kosovo. Various models of the M-151 have seen successful military service in 15 different NATO countries and M151s were sold to many countries, including Canada, Denmark, Lebanon, Israel, the Philippines the United Kingdom and non-NATO countries like Pakistan. Currently, the M151 is used by over 100 countries worldwide. Specifications. Bodywork. Length/width/height/wheelbase – cm (in) : 338/163/180/216 (133/64/71/85); weight : 1070 kg (2400 lb). Engine. Inline 4 cylinders 2320 cc (141,5 ci), 4-speed manual gearbox, rear or 4x4 wheel-drive . maximum power : 71 bhp @ 4000 rpm; torque : 173 Nm) @ 1800 rpm.